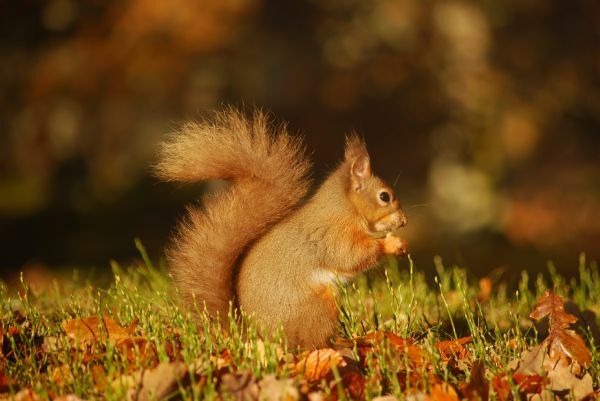 The National Park is a refuge for our native red squirrels. In fact they are doing so well here that there are enough to export some to other parts of Scotland. Whilst you’re walking through the forests listen out for the skittering of claws on tree bark, and perhaps even the thud of a chewed pine cone hitting the floor. Look up amongst the branches and you might see a soft, bushy red tail arc along a branch and spring through the air. More skittering claws, perhaps a bit of chitter-chatter to let you know you’ve been spotted. And if you’re lucky you can follow one of nature’s finest acrobats as it dances amongst the tree tops. Latest reports are that grey squirrels are being pushed further back away from the Park boundaries. And recent research shows that pine martens, which are making a comeback, prefer to eat grey squirrels rather than red. So perhaps the time is right for a comeback? To find out more about the work going on to save red squirrel, click the “action” tab on the right.